Zhang He is an eccentric man who is obsessed with dancing and beauty. He starts as an officer under Yuan Shao but joins Cao Cao either during or after the Battle of Guan Du. 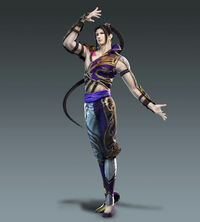 Once the Three Kingdoms are formed, he is sometimes ordered to guard Mt. Tian Dang. After he suffers defeat, he assists Xiahou Yuan's defense at Mt. Ding Jun. He often assists the capture of Han Zhong and partakes in deflecting Shu's advance in their Northern Campaigns. A few scenarios depict his death at Mount Qi.